For those who suffer the loss of their veteran, or for those whose veteran is deployed, it is a day of non-avoidance. As we know, my veteran is no longer with me. Funny, my dad was also a veteran, and I miss him too. This past Saturday I opened the door to my son’s bedroom. I looked around and thought, “ok Cole, enough of this already, it’s time to come home!” Some would say to me as response, “he is home.” And you know what? My spirit agrees, but my maternal heart and mind does not. Tomorrow when I raise the American flag (U.S.A) I will be moved to a place of non-avoidance. The “missing” of Cole is hitting pretty hard these days. Shock has side stepped as time has traipsed upon its reigning hour, and the missing is taking center stage–for us all. I will share a photo here, only because I intend to honor the many veterans whose bravery is incomprehensible to me. 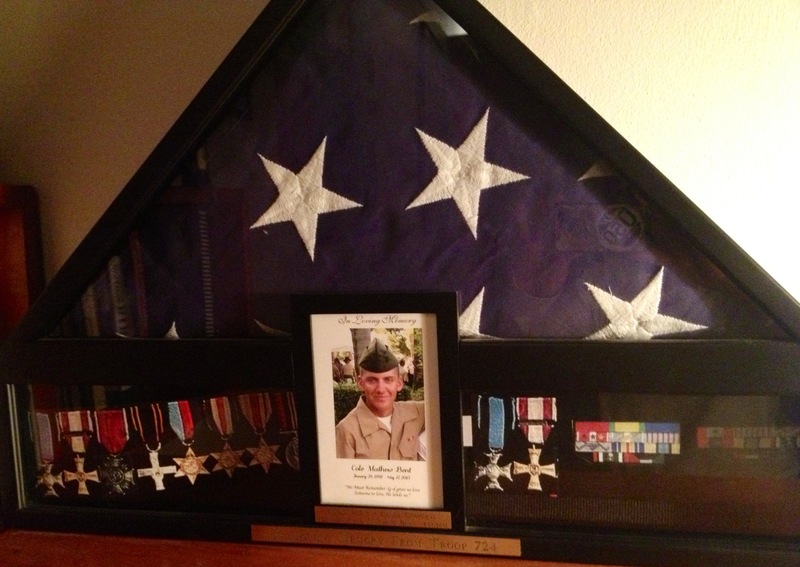 The picture is of the folded flag our family was presented at Cole’s posthumous honor ceremony, the medals are not his (those are placeholders awaiting his mom, me, to finish the shadow box presentation–a task I do not wish to accomplish as it would imply I am moving into a place of acceptance of my loss, which I am not). Yet by doing something difficult for me, facing this reality upon the shelf, I hope to honor our men and women veterans and their inspirational tenacity, their example of bravery, and in doing so honor those same qualities once held by my son. For those reading this post, may you be reminded to extend gratitude tomorrow (and every opportunity henceforth) by saying, “thank you for your service,” to the women and men who willingly stand up and defend our rights and freedom. Cole, thank you for your service.